For other uses, see Automat (disambiguation). An automat is a fast food restaurant where simple foods and drink are served by vending machines. The world's first automat was named Quisisana, which opened in Berlin, Germany in 1895. 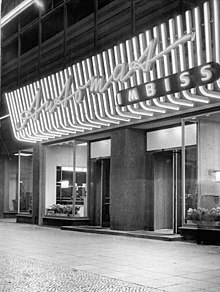 The first automat in the world was the Quisisana automat, which opened in 1895 in Berlin, Germany. In Japan, in addition to regular vending machines which sell prepared food, many restaurants also use food ticket machines (Japanese: 食券機, translit. 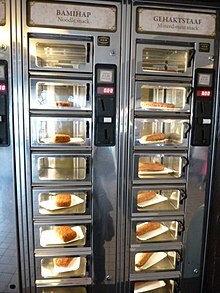 shokkenki), where one purchases a meal ticket from a vending machine, then presents the ticket to a server, who then prepares and serves the meal. Conveyor belt sushi restaurants are also popular. Originally, the machines in U.S. automats took only nickels. In the original format, a cashier sat in a change booth in the center of the restaurant, behind a wide marble counter with five to eight rounded depressions. The diner would insert the required number of coins in a machine and then lift a window, hinged at the top, and remove the meal, usually wrapped in waxed paper. The machines were replenished from the kitchen behind. All or most New York automats had a cafeteria-style steam table where patrons could slide a tray along rails and choose foods, which were ladled from tureens. The first automat in the US was opened June 12, 1902, at 818 Chestnut St. in Philadelphia by Horn & Hardart; Horn & Hardart became the most prominent American automat chain. Inspired by Max Sielaff's AUTOMAT Restaurants in Berlin, they became among the first 47 restaurants, and the first non-Europeans, to receive patented vending machines from Sielaff's Berlin factory. The automat was brought to New York City in 1912 and gradually became part of popular culture in northern industrial cities. The automats were popular with a wide variety of patrons, including Walter Winchell, Irving Berlin and other celebrities of the era. The New York automats were popular with unemployed songwriters and actors. Playwright Neil Simon called automats "the Maxim's of the disenfranchised" in a 1987 article. The format was threatened by the arrival of fast food, served over the counter and with more payment flexibility than traditional automats; in the 1970s, the automats' remaining appeal in their core urban markets was strictly nostalgic. Another contributing factor to their demise was inflation of the 1970s, making the food too expensive to be bought conveniently with coins, in a time before bill acceptors commonly appeared on vending equipment. At one time there were 40 Horn & Hardart automats in New York City alone. The last one closed in 1991. Horn and Hardart converted most of its New York City locations to Burger Kings. At the time, the quality of the food was described by some customers as on the decline. In an attempt to bring back automats in New York City, a company called Bamn! opened a new East Village Dutch-style automat store in 2006, but it closed in 2009. A second attempt to bring back automats to the United States is Eatsa which offers quinoa based dishes. An automat in Manhattan, New York City in 1936. 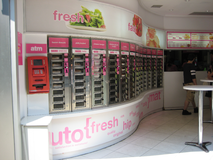 A modern automat in Manhattan's East Village, circa 2007. Automat at 1165 Sixth Avenue, New York City, in the 1930s. A Horn & Hardart postcard explaining how food was served in an automat (c. 1930s). A form of the automat was used on some passenger trains. The Great Western Railway in the United Kingdom announced plans in December 1945 to introduce automat buffet cars. Plans were delayed by impending nationalisation, and an automat was finally introduced on the Cambrian Coast Express, in 1962. In the United States, the Pennsylvania Railroad introduced an automat between Pennsylvania Station, New York City and Union Station, Washington, DC, in 1954. Southern Pacific Railroad introduced automat buffet cars on the Coast Daylight and Sunset Limited in 1962. Amtrak converted four buffet cars to automats in 1985 for use on the Auto Train. The last one in use in the United States was on the short-lived Lake Country Limited in 2001. In Switzerland, Bodensee–Toggenburg Bahn introduced automat buffet cars, in 1987. ^ Smith, A.F. ; Oliver, G. (2015). Savoring Gotham: A Food Lover's Companion to New York City. Oxford University Press, Incorporated. p. 24. ISBN 978-0-19-939702-0. Retrieved June 15, 2017. ^ a b Lui, Claire (2006). "Bamn! The Automat Is Back – Restaurant – Food & Drink". American Heritage Magazine. Archived from the original on 2007-10-20. Retrieved 2015-03-15. ^ "Horn & Hardart Automat, 968 6th Ave. between 35th & 36th Sts. (1986)", 36th Street, New York City Signs -- 14th to 42nd Street. ^ a b Barron, James (April 11, 1991). "Last Automat Closes, Its Era Long Gone". The New York Times. Retrieved 2009-07-16. ^ "New York's Last Automat Closes". St. Petersburg Times. Associated Press. April 11, 1991. Retrieved 2009-07-16. ^ Matthews, Karen (August 28, 2006). "Updated Automat to open in New York City". boston.com. Associated Press. Retrieved 2006-08-28. ^ Amanda Kludt (March 9, 2009). "The Shutter: Felled Bamn! to Become Baoguette?". Eater NY. ^ O'Neill, Natalie (19 July 2016). "This Midtown vending machine is serving up lunch". Retrieved 5 June 2017. ^ "Automat Buffet Cars For British Railways". Reuters. 26 December 1945. ^ "Railway Gazette". The Railway Gazette. 119: 709. 1963. ^ "Automatic Buffet-Bar Car Introduced By Pennsy". Locomotive Engineers Journal. Brotherhood of Locomotive Engineers. 88: 236. 1954. ^ Jane's World Railways. Jane's Yearbooks. 1988. p. 700. ISBN 0-7106-0871-3. 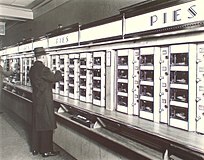 Wikimedia Commons has media related to Automats.